After giving you a fairly detailed documentation of how my word for 2013, Adventure, played out this past year, it seems a bit anti-climactic to end up with a similar word for this year. I tried to avoid it actually. I told God, "That's actually kind of boring. I just did the whole Adventure/Bravery thing. And now Courage? Isn't this all the same?" And, yes, it kind of is. I was hoping for a word that would stir more curiosity. A word that would make me say, "What in the world is going to happen this year?!" This felt more like, "Great. I get to learn how to not be anxious again, not be fearful again, and not be a worrier." But this was my word and there was no changing it. On the first Sunday of the month, John Riner said, "Faith chooses courage over cowardice." When he said the word "courage," my ears perked up a bit. (That's when the denial began.) But as I took time to listen that Sunday, the word wouldn't go away. 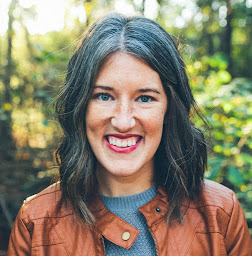 I began jotting down some thoughts on this next year and I wrote, "I believe in God for the courage to continue living in and trusting in his goodness no matter what. I believe God is the God of miracles. I believe in miracles and I want the courage to always ask for them." This past Sunday served as even more affirmation that this was my word. But because of me not wanting this word for 2014, it's caused me to do a little thinking. When you look up "bravery" and "courage," you see that they are synonyms of each other. (I know, duh.) Their definitions are almost identical. However, there was one tiny difference I noticed. Bravery is the ability to face danger or pain without being fearful. Courage is the ability to do something you know is dangerous. There's something a bit different about facing a situation in which you know, in advance, is dangerous. But still. After looking up definitions and trying to find something extremely intellectual about Courage for 2014, I felt a lot of blank space. 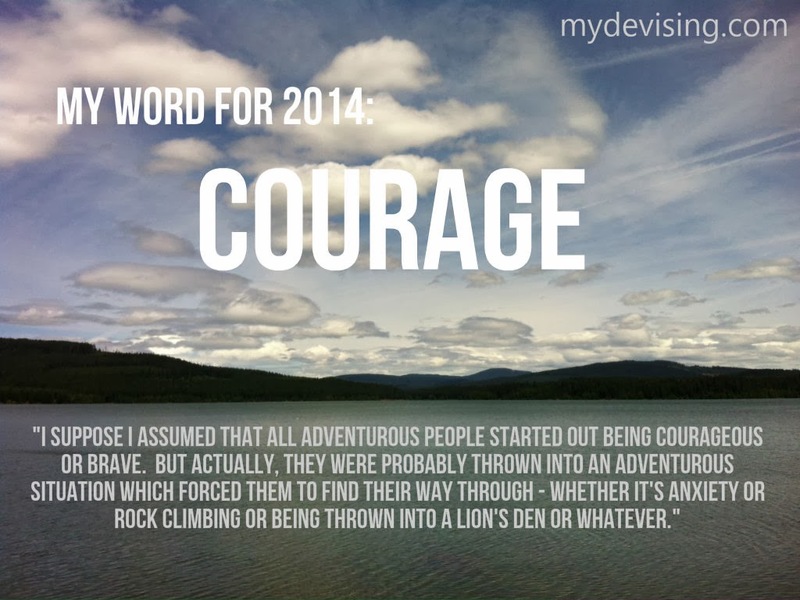 Actually, I felt that having Courage as my word for this year was kind of taking me on a backwards journey. Shouldn't I have learned Courage and Bravery before the Adventure? The definition of "adventure" is an unusual and exciting, typically hazardous, experience or event. Adventure is exciting and dangerous all at the same time. Adventure was thrown in my face in 2012 and I was forced to deal with it. My adventure was: Here's a panic attack. Here's anxiety. What will you do with it? There I was, having to sift through all of it in my body, mind, and heart. Months and months of work. I made Adventure my word for 2013 not just because I felt God had placed it on my heart, but because it was the way that I was going to claim this so-called Adventure. If this is my adventure, then fine. I'll do it. I made strides and, in the midst of it, I think I found some bravery inside of me that I didn't know I had. (Adventure) A dangerous and exciting experience. (Bravery) Facing danger or pain without being fearful. (Courage) Doing things I know are dangerous. Actually, when you look at it like that, it's not backwards at all. I suppose I assumed that all adventurous people started out being courageous or brave. But actually, they were probably thrown into an adventurous situation which forced them to find their way through - whether it's anxiety or rock climbing or being thrown into a lion's den or whatever. So instead of rolling my eyes at Courage, I'm nodding my head in agreement now. Adventure was more of a "big picture" word. Courage is more of a "let's-get-down-to-the-nitty-gritty" word. So I will be courageous. I will do things I know are dangerous. To be clear, I'm not planning on skydiving anytime soon or purposefully walking janky streets at night just so I can be in the face of danger. But I'm going to be more open to risk. I'm going to listen more to what I hear the Spirit saying. I started this post a little uninspired and with only a couple thoughts on Courage. As I began writing, things started pouring out of my heart. Sometimes I think we just need time to process. As an encouragement to you, take time to do that with your word for the year. Talk it through with someone and maybe you'll arrive at some really neat conclusions. Or write it out. You may begin noticing things that you wouldn't have noticed otherwise. Figuring stuff out like this is part of the fun. We're only 14 days in to 2014, so I don't really know how Courage is going to play out. But I'm really excited to see what's coming next. You should totally go skydiving, though. Because it's awesome! Man, God is so amazing. I love to hear the way that he has made you ready for adventure and courage. They are so similar, but definitely different too! I know the Lord is going to do some amazing things this year!